Salt Lake lies in a mountain valley with the Wasatch Mountains to the east and north. The Oquirrh (pronounced "oaker") Mountains border the western edge of the valley. Salt Lake&apos;s official elevation is 4,330 feet/1,320 meters above sea level. The city is situated on land once covered by the prehistoric Lake Bonneville. This ancient lake existed within portions of Utah, Nevada, and Idaho, with an elevation rising from 4,200 feet to 5,200 feet (1,280 meters to 1,585 meters) at some points. The eastern and northern portions of the city are located on a series of terraces, or former beaches, which are known locally as "the benches." Safety belts are required by law in Utah. All occupants of private vehicles must be wearing safety restraints. Children should be secured in car seats or safety belts. Please don&apos;t drink and drive. Like many Western states, Utah has stringent laws. A blood alcohol content of 0.08% or more is considered "driving under the influence" and you will be arrested and charged with a crime. Salt Lake is 4,300 feet above sea level. Consume alcohol cautiously as it has more effect at this altitude, and even more at ski area altitudes of 7,000-8,000 feet. 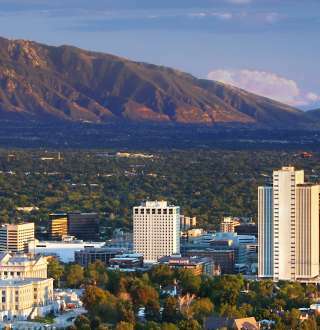 Salt Lake, and Utah, are highly regarded as business locations and travel destinations. Find out where Salt Lake ranks in the "Best of the Best" lists from various publications. Utah is in the Mountain Time Zone and uses Daylight Savings Time. Utah&apos;s area codes are 801, 385 and 435. Unless otherwise noted, the area code for telephone numbers listed on this site is 801. Misperceptions abound when it comes to Utah&apos;s liquor laws. It is as easy to get a drink in Salt Lake as it is to order a meal. Salt Lake&apos;s citizens are a blend of religious and cultural backgrounds. Most of the world&apos;s denominations are represented in Salt Lake.